(CNN) -- Quarterback Brett Favre threw three touchdowns for the Minnesota Vikings on Monday, to help give his new side a 30-23 victory over former club Green Bay. Favre also threw 271 yards and completed 24-of-312 passes without interception in the first meeting against his old Packers' teammates, to add to his stature as the all-time NFL pass leader. 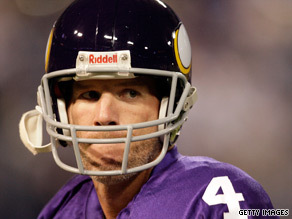 "It's sweet but it has nothing to do with revenge," Favre told reporters after the game. "I'm emotional but I'm always emotional. I knew there was a lot riding on the game. This one carried a little more weight. "One game does not define my career. I wasn't out to prove anything. I was out here to play. It was a lot of fun," Favre added. The 39-year-old, who is just shy of his 40th birthday, became the first quarterback in NFL history to defeat every team in the league with the win and helped to put The Vikings equal with the New York Giants, New Orleans Saints, Indianapolis Colts and Denver Broncos on four wins from four games. Favre threw to Bernard Berrian for his third touchdown pass of the game to put his side 28-14 ahead. Green Bay replied with a 14-play run to the Vikings one-yard line but on fourth down, a dropped pass in the end zone gave the momentum back to Minnesota. Minnesota's Jared Allen brought down Packers' quarterback Aaron Rodgers in the end zone for a safety to give a 30-14 lead to the Vikings, and despite a Green Bay rearguard, Vikings held on for the win. The sellout crowd at the Metrodome gave Favre a rousing welcome before the game, that saw the legendary quarterback play his former club of 16 sixteen years for the first time since joining the Vikings on August 18. In his time with the Packers, Favre helped the Wisconsin-based side capture the Super Bowl in 1996.